Size of babe: at our ultrasound yesterday we were told baby boy is weighing in at 14 1/2 ounces. the baby apps say he is as long as a carrot. Symptoms: still wanting to smell all of the baby clothes like a crazy person, round ligament pain, getting up many times a night to go to the bathroom, the crazy dreams are back, some nights I sleep hard all through the night, some nights I'm not sleeping so well, still a lack of an appetite which is weird at this stage but the doctor says as long as I'm getting enough nourishment then its all good for now. Loving: cereal, especially cocoa crispies, pepsi in those baby cans, bagels with cream cheese, being cozy in bed, fresh flowers in the house, cleaning random things with a vengeance. 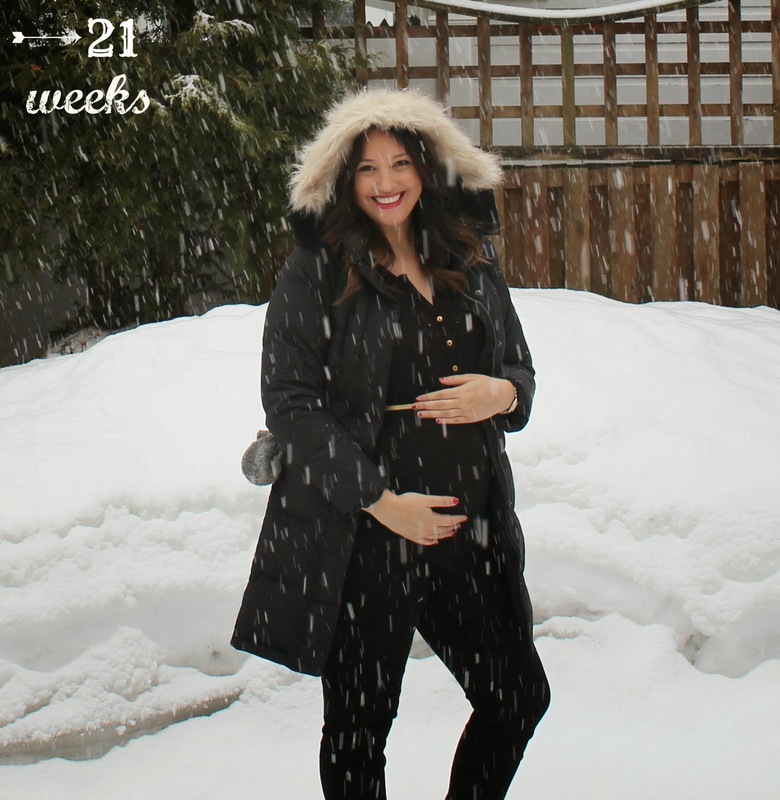 Loathing: how fast all of the hair is growing around here (shaving is basically pointless), bending down or squatting down, the new snow, getting pretty for the bumpdate pictures! 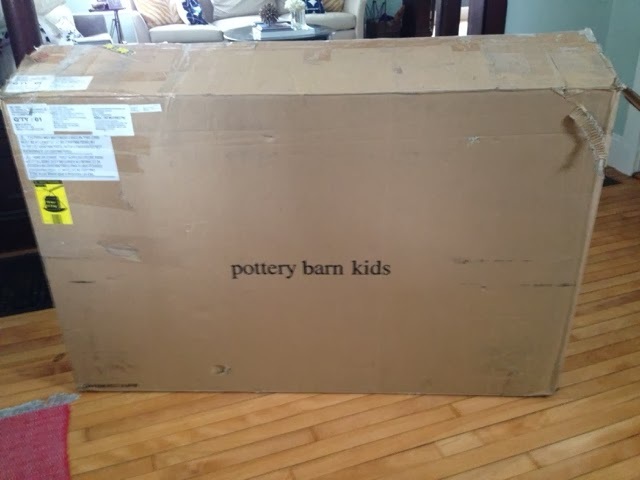 Husband: we had a complete surprise yesterday when the ups man delivered our dream crib from pottery barn! it turns out that my mother in law and my mom schemed up a plan to hunt down the last crib in our desired finish in all of america and have it shipped to maine to cheer me out of my winter blues. my mother in law can be relentless when she gets an idea and I'm glad I wasn't on the other end of the call when she located that one crib! we were so surprised when it showed up that of course I cried - but justin's reaction was the best: he wanted to put that crib together that instant. unfortunately, our nursery is still a guest room and will be for while longer, so we didn't really have anywhere to put it...justin wanted to put it together in our other guest room, our living room, wherever he could. sadly, it's still in the box, but his daddy instincts were super cute to watch. Wedding Rings: off and so are other jewels. my skin has developed an extreme sensitivity to metals (even the real ones) and I'm jewelry free at the advice of my doctor. Movement: sometimes. I actually asked the doctor if it was ok that I can't feel him regularly and it doesn't seem that the movement is increasing in strength or intensity. I was assured that he's still super little and I'll be feeling him more than I'd like sooner rather than later. 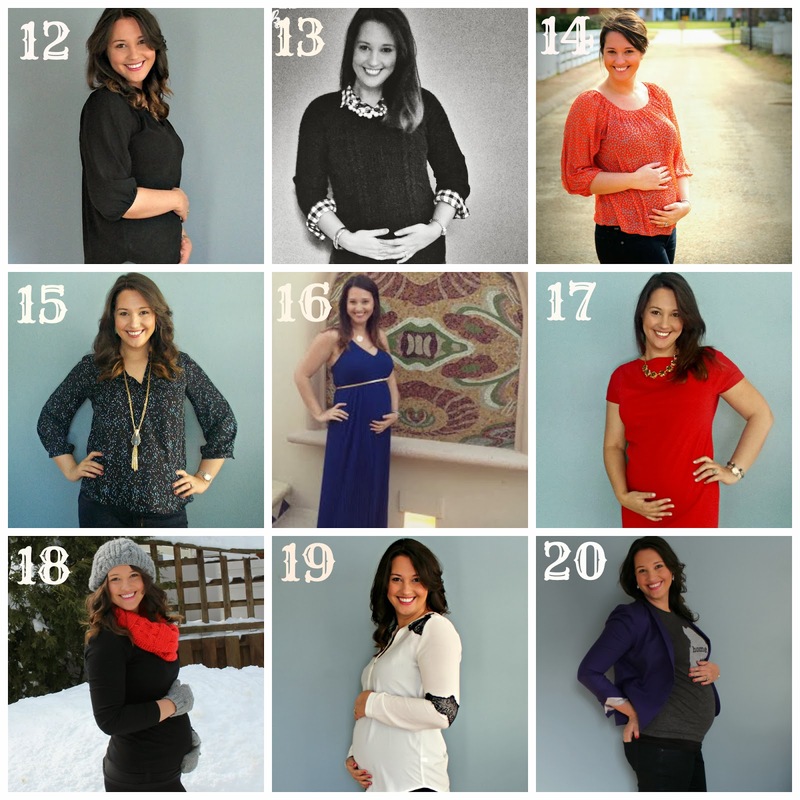 Maternity Clothes: same old, same old. Justin mentioned the other day that the sweater I was wearing was getting a bit short....so while I'm still rocking regular tops I may have to re-evaualate some of them! Best Part of the Week: gray got so much love in the mail this week! besides the surprise crib delivery, he also received a package from his grandma mary (justin's mom) full of hand smocked baby boy things. she also monogrammed a few sleeper sets for him and that was the first time I've seen his sweet little monogram...and I died of southern girl happiness. on one of the pieces she actually embroidered his full name in script (surprise! gray is not our baby's first name!) and I literally swooned over how beautiful it looked. total girl/preggo moment. another highlight: the night justin surprised me with ice cream with hot fudge and caramel from cold stone for dinner. Worst Part of the Week: the winter storm warning and impending 2 feet of snow we're expected to get today and tomorrow. so much for spring. Missing Most: not really anything...I mean warmth would be good, but otherwise, there isn't really anything that I'm missing right now. Can't Wait: to be able to start the nursery! that crib is just calling my name, begging me to set it up and put a little babe in it! Why the outside snow storm pics? the snow snuffs out all of the natural light in my usual indoor photo spot...so my only option was to head out and do this shoot as quickly as possible. Nothing like two feet of snow to add to the ambiance! You look so great! I know you're sick and tired of all the snow but it really is gorgeous! That's so awesome you were able to get the crib you want!! Glad to hear Gray was officially confirmed a boy. Can you imagine how shocking it would be if they told you you were having a girl?! cutest ever! What a sweet surprise - hang in there, the weather WILL get better and you'll be in perfect Maine summer/fall and you'll think "oh, maybe I can live here after all". Seriously you are adorable! 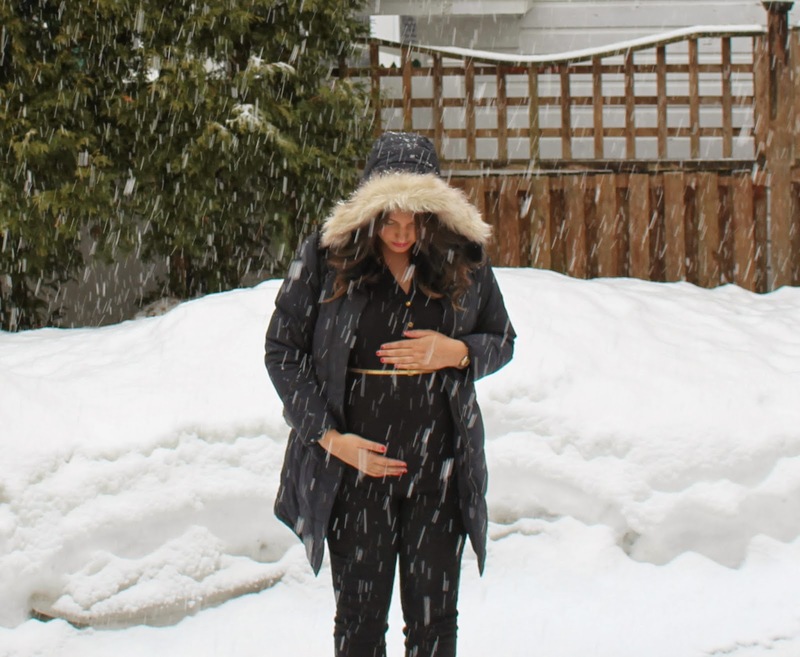 I feel you on getting pretty for bumpdate photos. Pretty much the only dau of the week my hair is not in a ponytail! Is the babies name Grayson? Or is Gray just his blog nickname? It's okay if it's still a secret!